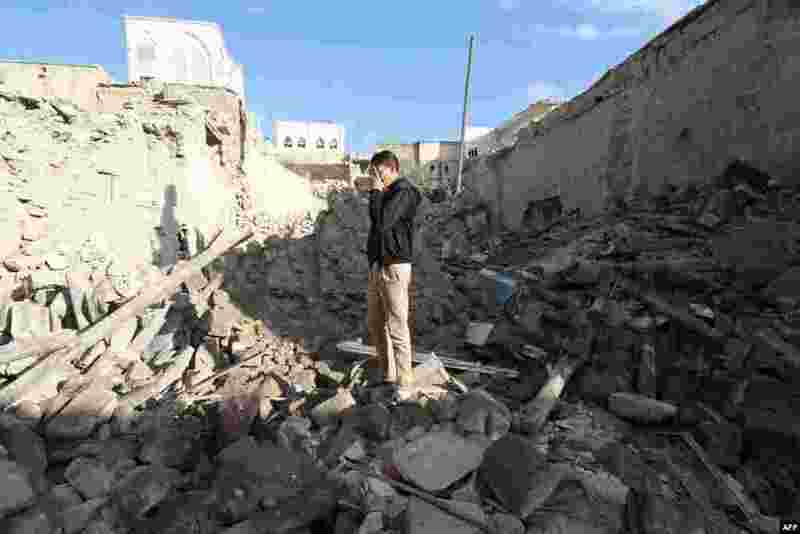 5 A Syrian man stands on top of rubble following an overnight rocket attack on the contested Bab al-Hadid neighborhood of the northern city of Aleppo. Once Syria's economic hub, Aleppo has been ravaged by fighting that began there in mid-2012 and the city is now divided with government forces controlling the western part and rebels controlling the east. 6 Local residents dressed as Father Frost, an equivalent of Santa Claus, and his granddaughter Snegurochka (Snow-Maiden), walk with servicemen as they visit checkpoints of the Ukrainian army and self-defense units to congratulate the military with the coming of a New Year, near Lysychansk, Luhansk region. 7 A woman holds a placard showing Hungarian Prime Minister Viktor Orban as a soccer player during an anti-government protest called by civil groups in Budapest. 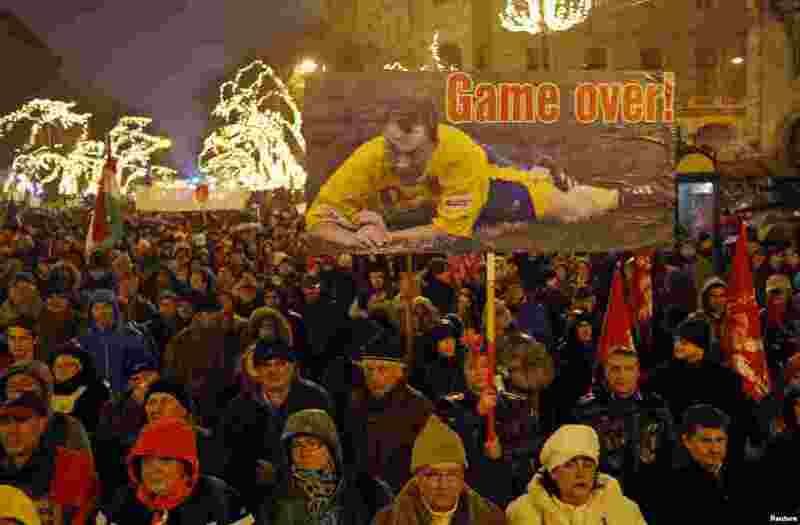 The protest follows a number of other rallies against Orban's government, which has seen a plunge in popularity over the past months. 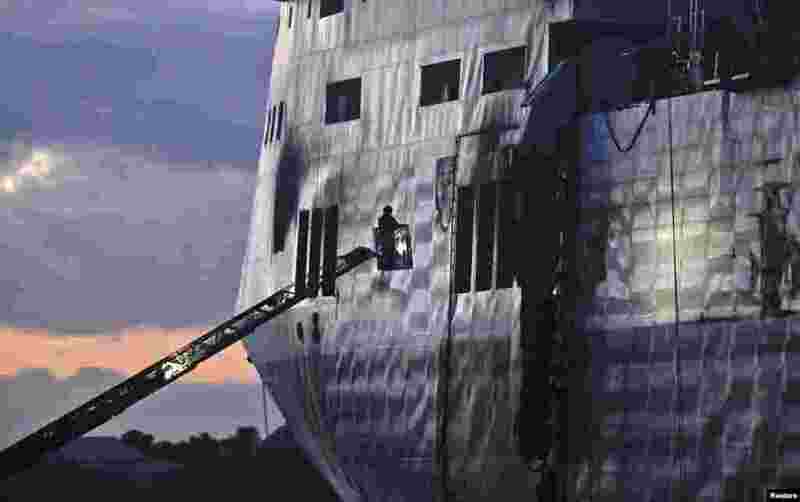 8 Firefighters stand on a ladder to inspect the Norman Atlantic multi-deck car-and-truck ferry docked at Brindisi harbor. Tugboats hauled the burnt-out hulk of the ferry that caught fire on Sunday off the coast of Greece into the southern Italian port on Friday, opening the way for an investigation into the cause of the blaze that killed at least 11 people.